Indian history of Plain Township shows that bands of Mingo, Delaware and Wyandot Indians once dwelled here. When Ohio became a state in 1803, 200-300 Indians were in Plain Township. 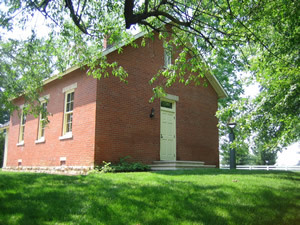 Historic Schoolhouse on Kitzmiller Rd. 1802 – Dudly Woodridge was granted a tract of land designated as Range 16, Township 1, for 4000 gallons of Monongahela Whiskey or $1.00 per acre. Adam and Sevilla Huffman Baughman and Henry Huffman came to this area cutting a path through the woods and built their cabin near Rocky Fork Creek. In 1810, Plain Township was organized and named for the “flat” land, which along with good water, made the area very attractive to the pioneer. In 1815 – 1816, Plain Township was reduced to its present size – about 20,000 square acres. In 1814, the first ground for a cemetery was donated by John Smith who, later on, was the first to be buried there. Henry Triplet built the first frame house. 1820 – Schooling had been taught in log cabins. Church services were conducted by traveling ministers. In 1821, a frame school building was built on Central College; the teacher was Jacob Smith. Dan Kramer started a lumber mill on Blacklick Creek in 1827 and built the first brick home. In 1837, Nobel Landon and William Yantis platted land that they owned located in the center of the Township. This land was split into lots 50 x 100 feet and sold to new settlers. It is uncertain how New Albany got its name, but we know it was named by Noble Landon, one of the founders, and it was included on the original plat map of the town in 1837. Landon grew up in Albany, Vermont and moved to Ohio as a young man. He was a very skilled carpenter and built houses in the Licking County area and sold them “turn-key”. He selected the name for St. Albans Township (Licking County) and was a postmaster in Johnstown. He built houses in both areas. Later, Landon bought land in the area which is now New Albany and built the first building there (an Inn) at the southeast corner of Main and High Streets. He was also the first postmaster of New Albany. In 1836 a small community near Athens, in southeast Ohio, obtained the name “Albany, Ohio”. It is believed that could be the reason Noble Landon chose “New Albany” for the name of our town. In 1836, the first brick church was constructed by the United Brethren at a cost of $1,100. In 1838, a Post Office called, “Hope, Ohio” was established by Mr. Landon being the first postmaster. In 1846, Noble & Louisa Landon donated land for a Methodist church in “town” at the corner of Main and Third Streets. In 1856, New Albany Village was chartered and S. Ogden was elected Mayor. Population was still 50. Village streets were dirt and sidewalks were sawdust. In 1859 the first Masonic Lodge hall was built, but was destroyed by fire. The Civil War years saw many men joining the Army for the Northern cause. The “Mustering Out Book of 1864” shows many Plain Township names. In 1874, a new brick school was built in the Village; dedication of the Caledonia Lodge F.O.M. was made. In 1875, Second Street was opened, oil lamps were kept filled and in 1878, oyster suppers were held. In 1880 came new industry. Wilkins Lumber Mill started in 1881, now known as the New Albany Mill. Village fathers were looking for a new cemetery and Maplewood Cemetery was established. Lots went on sale 1882 for $9/each. The Township Hall was built in 1885 and a jailhouse constructed behind the hall at a cost of $150. In 1892, a Board of Health was formed to resolve the Diphtheria Epidemic. The speed limit in the village was 2 mph and in 1901, telephone and gas lines were laid in. In 1901, autos came to New Albany when roads were half dirt-half gravel. The horses used the dirt side and autos used the other side. Other businesses were hotels, dry good/grocery store, restaurants with liquor sales, boot makers, blacksmithy, barbers and doctors were in demand for the 300 residents of the Village. In 1916, property owners were assessed 86 cents per square foot for cement sidewalks that were laid. In 1922, Mrs. Edward Babbitt became the first woman mayor of New Albany. Other businesses were established and a new school was built called the “New Albany School of Plain Township”. In 1943, the Volunteer Fire Department was organized. In 1946, the Lion’s Club was founded with Howard Underwood elected as the first president. In 1956, a new elementary school was built and the Plain Township Fire Department built an Association building and a firehouse in which to put equipment. Miller Avenue was added. Two bars were built when liquor was legalized. In the 1960’s, sub-divisions sprang up with Cedar Brook being the first in 1966, followed by Taylor Estates, New Albany View, Plain View, Pine Meadows and Oak Field. In 1967, a new Post Office was built by Gene & Louse Mayer and leased to the US Government. The New Albany Savings & Loan Bank was built by the C. Howard Cring family. Later the Village got new sidewalks and alleys. A bell tower was erected using the bell that was placed in the old Methodist Church in 1881. In 1980 the census for the Village listed 414 residents and 4,897 people living in the Township. School enrollment was as high as 1,200 students. In 1988, there were petitions for a merger with Plain Township and the Village and a commission was established of ten people to work on the plans. The merger was defeated. Fire Chief Fred Whitehead had been chief since April 1955, a total of 33 years. Since 1976, the New Albany Founders Day Celebration has been an annual event. In the early 1990s, the Plain Township Fire Department transitioned from a volunteer department to a full-time professional department. In 1997, the new Plain Township Fire Station was constructed at 9500 Johnstown Road. This station houses 12 firefighters per shift, a 100 foot ladder truck, a heavy rescue, and engine and a third engine, along with three medics and personnel vehicles. In 2003 the Plain Township Aquatic Center opened on 7 acres adjacent to the Plain Local School District Campus. The pool holds 270,000 gallons of water and features two soaring water slides, an eight lane competition pool, a kids interactive area and zero-depth entry pool with fountains. In 2006, the Mid-Ohio Regional Planning Commission Population Estimates shows the Township with 802 households and the Village with 1,865 households. In 2015, MORPC has estimated the Township with 862 households and the City of New Albany with 2,767 households. In 2006, Plain Township partnered with New Albany and the Plain Local School District to develop a community performing arts center, which is known as the Jeanne B. McCoy Community Center for the Arts and was completed in 2008. In 2008, Plain Township, New Albany and Columbus entered into an Annexation Agreement to provide for a Metro Park in Plain Township. In 2013, Metro Parks had acquired over 1,000 acres of park land. Rocky Fork Metro Park is scheduled to open in Plain Township in the spring of 2015.